Sarwar Imran has been appointed Bangladesh's assistant coach for the India series next month. Since the newly-appointed head coach Chandika Hathurusingha is supposed to arrive on June 10, Imran will be in charge of the 23-member training camp that begins on May 26. The three-match ODI series begins on June 15, which would give Hathurusingha very little time to get acquainted with the team. Imran is expected to help him out in that regard. Akram Khan, the BCB cricket operations committee chairman, did not give a timeframe for Imran's appointment. "We have appointed Imran bhai as assistant coach for the upcoming India series," Akram told ESPNcricinfo. "Since Hathurusingha arrives on June 10, Imran bhai will begin the training from Monday. He has been Bangladesh's coach previously. He will be with the team till the India series, and then we will take it from there. " Imran, a highly-respected figure in Bangladesh cricket, was coach of the last two Dhaka Premier League champions, Victoria Sporting Club and Gazi Tank Cricketers, while also having had multiple stints with the national team previously. 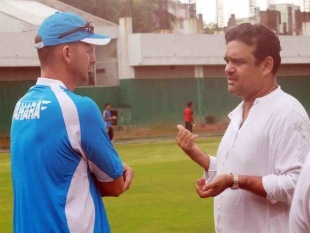 He was Bangladesh coach in 2000 when the team played its inaugural Test match, after Eddie Barlow fell ill. Later he was in charge during a tri-series between Bangladesh, India and South Africa and a two-match Test series against South Africa in 2003, after which Dav Whatmore took over. Imran was also Bangladesh's bowling coach on various occasions. Akram said the hunt for the bowling and fielding coach was progressing well. "We have lined up a few coaches, and we are still in discussion with them. Hopefully we will finalise someone soon," Akram said.